The MODIS instrument aboard NASA's Terra satellite captured this image of the Fort McMurray wildfire on May 8, 2016. 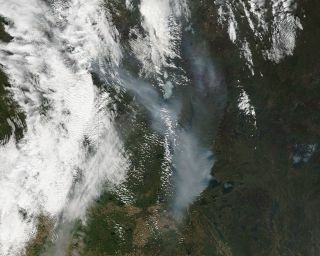 Newly released satellite images capture the massive scale of the wildfire rampaging through Canada's Alberta province. The Fort McMurray wildfire has consumed a huge swathe of Alberta forest, and the resulting smoke has drifted all the way to the Atlantic Ocean, the new photos show. The images were taken by NASA's Terra satellite and the Suomi National Polar-orbiting Partnership (Suomi NPP) spacecraft, which is operated by NASA, the National Oceanic and Atmospheric Administration and the U.S. Department of Defense, on Sunday (May 8). The Suomi NPP satellite took this photo of Canada's Fort McMurray wildfire on May 8, 2016. By that day, the Fort McMurray blaze had encompassed 398,000 acres (161,000 hectares) and was expected to continue to grow, according to an update delivered by Alberta Premier Rachel Notley. "Fire conditions remain extreme, with four new starts across Alberta yesterday. A total of 34 wildfires are burning, with five out of control, 23 under control and six turned over to the responsible parties," the update reads. "More than 1,500 firefighters, approximately 150 helicopters, 222 pieces of heavy equipment and more than 28 air tankers are fighting the fires across the province." The fire began May 1 near Fort McMurray, a city of about 60,000 people in northeastern Alberta. The region harbors huge deposits of crude oil in the form of oil sands, and for decades Fort McMurray has played a large role in petroleum production. The fire, therefore, could affect the Canadian economy, at least in the short term, experts have said. The MODIS instrument on the Aqua satellite captured this image on May 08, 2016, of smoke from the Ft. McMurray wildfire and other Canadian wildfires billowing across the Atlantic Ocean. More than 100,000 people in the Fort McMurray area have been evacuated to date, Canadian government officials have said. No deaths or injuries caused directly by the fire have been reported, although two people did die in a car crash during the evacuation. The Terra satellite and Suomi NPP — which launched in December 1999 and October 2011, respectively — both gather a wide range of data about Earth and its climate system using five different instruments each.